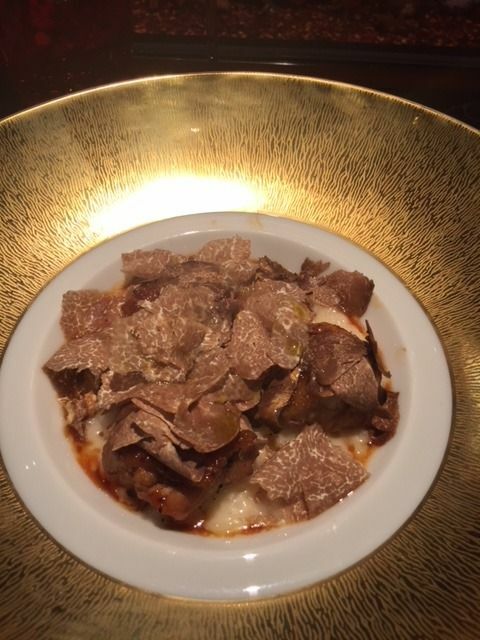 Bob Grimes, my companion at the Robuchon tasting, took this photo of the risotto paved with white truffle. I was distracted, eating around the city, high and low. I didn’t notice that a spaceship had landed on Tenth Avenue and was colonizing what used to be Colicchio & Sons. 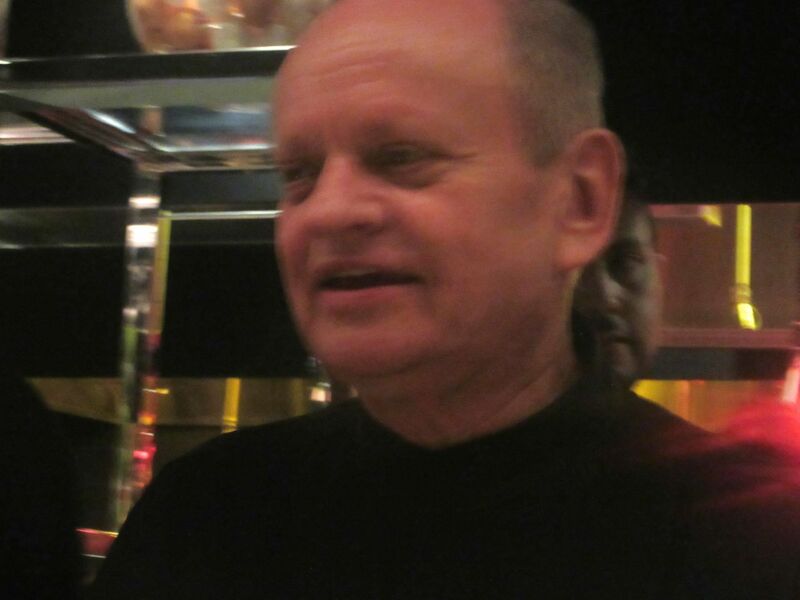 Then Eater announced that Joël Robuchon would open L'Atelier de Joël Robuchon in the Meatpacking District. 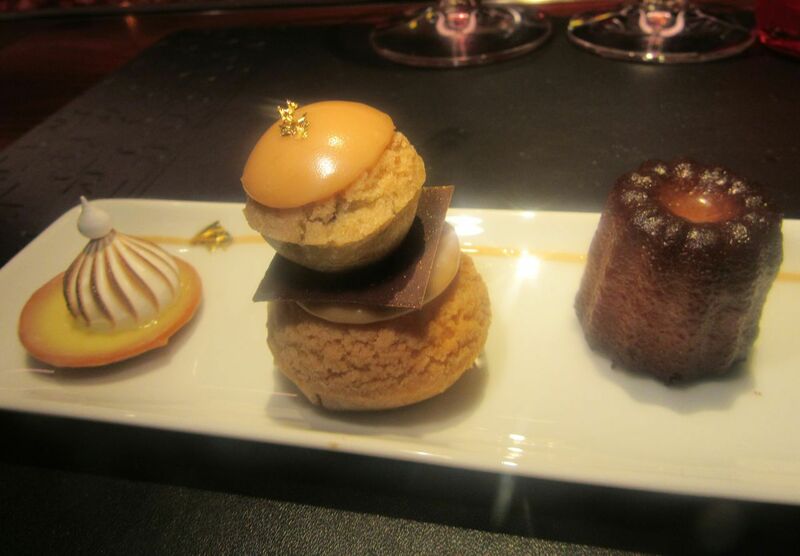 Yes, Robuchon was returning to Manhattan after an absence of five years, without alerting me. You feel you might be the sultanesse of Brunei when Robuchon, the great man himself, oversees your service. An aggressive pal of mine goes to work on Atelier maître d’hôtel Mario Wainer, brought here from the swooning Le Cirque. Miraculously I find myself in one of the precious counter seats next to this plucky guy and his wife, being greeted by Robuchon himself – all in black as usual -- at a Friends-and-Family night. Now, you may think I am mesmerized. Maybe I am. In recent months I’ve been championing real food, straightforward fare, rustic plates, cozy nooks, and now I’m about to clue you in on the rebirth of decadence. 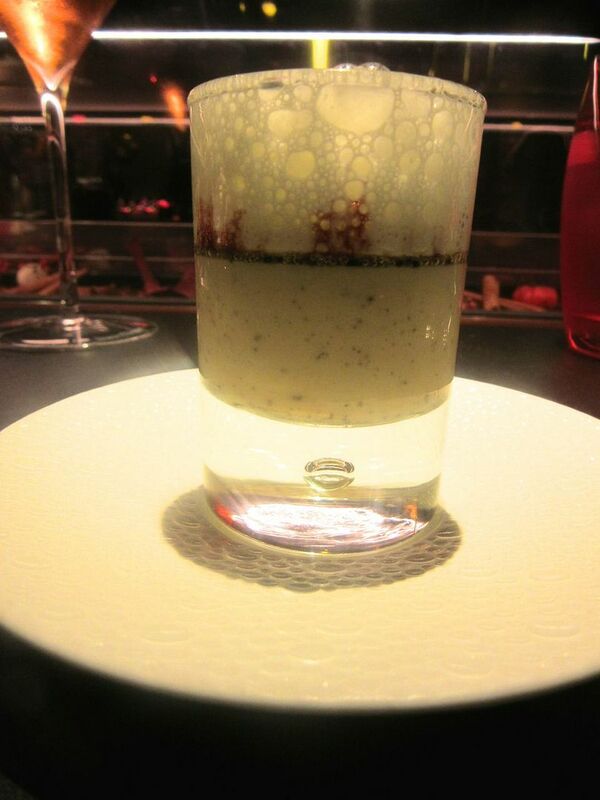 Cherry tomatoes float mysteriously in jars on red shelves at Ateliers de Robuchon all over the world. Apparently, over-the-top is not over for me. 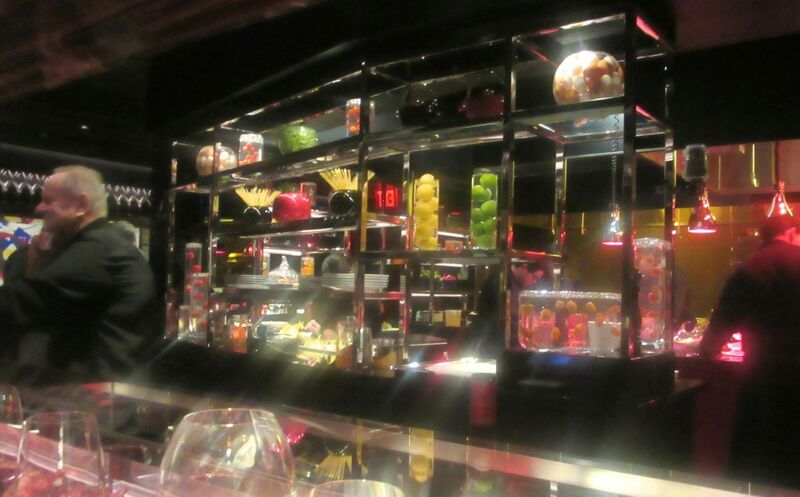 The vast, soaring space is a red and black stage set, designed for indulgence by Pierre-Yves Rochon. The perfect crystal. The classic Bernardaud plates. The lacquerware. The starched tablecloths. The satiny rosewood. The shelves of decorative objects. One young woman spends three hours a day replacing the contents of decorative jars so that fresh tomatoes will float in their gas-charged liquid. 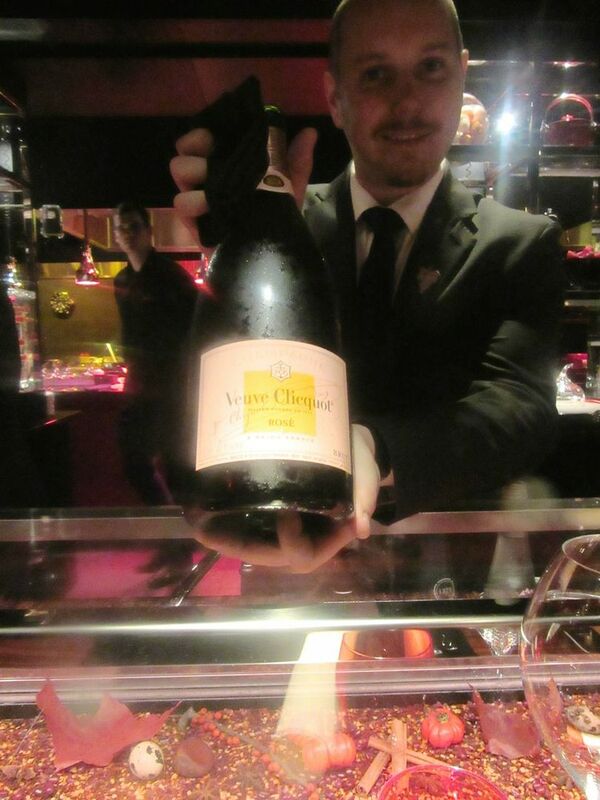 The sommelier is pouring Veuve Clicquot rose, so we’re in. I’m carried away, but you shouldn’t be. Remember, it’s a night for Friends and Family. Do not overlook that we get the “Dîner d’Inauguration,” counter special, the starship staff in full attendance pouring pink champagne, and we aren’t paying. 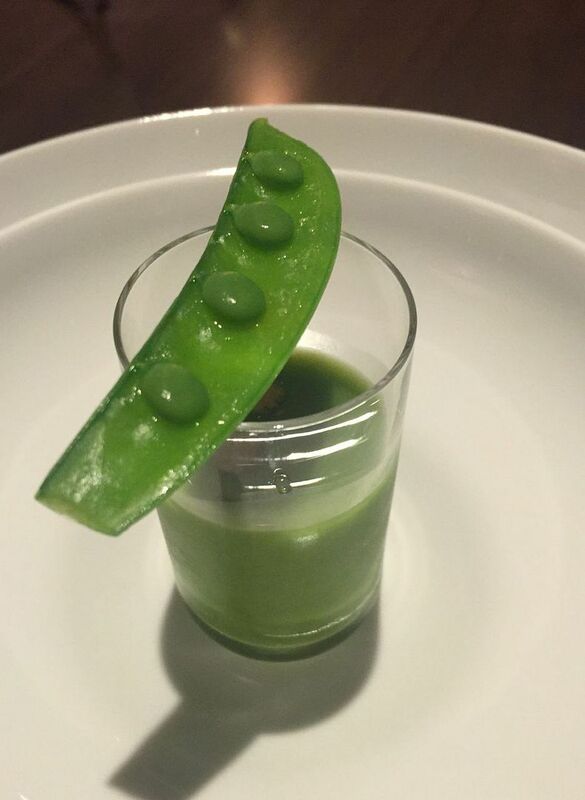 For you, the nine course tasting will cost $325 and the vegetarian version will be $145. Granted, you can economize in Le Bar with a sandwich, veal Milanese or rotisserie chicken, but then, why would you? Robuchon’s first team is out in force. Here, global warriors Philippe Braun (left) and Juan Moll. Newly slim and looking fit and young with pale blue eyes at 72 after losing 60 pounds, the chef seems especially interested in vegetables. “The United States has moved further along than France when it comes to organics,” Robuchon has told Florence Fabricant in the Times. 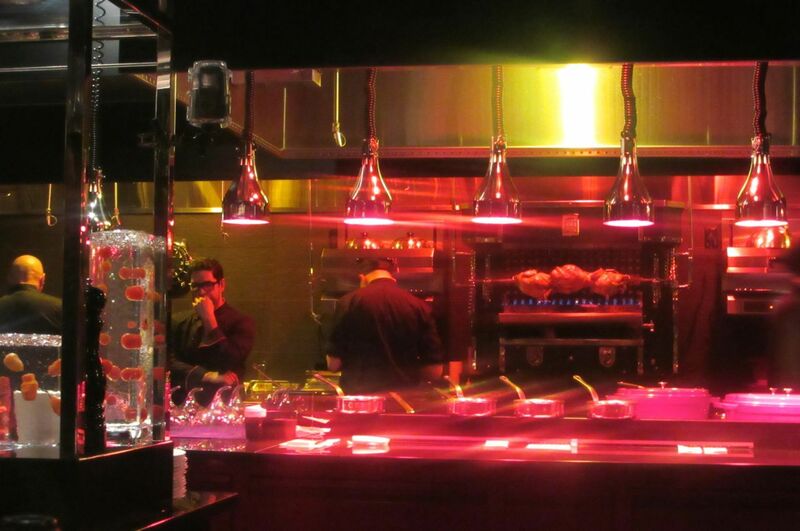 From our counter seats we can see into the kitchen where three chickens revolve on the rotisserie. It’s the Robuchon classic. I remember it from dinner at the Four Seasons Hotel and tastings at L'Atelier on the Left Bank. Indeed, I remember it richer. I think I remember it richer, but sometimes I can’t remember what day it is so, I’ll suggest you just enjoy the moment. The server detects our weakness for bread and leaves the red lacquer bowl within dangerous reach. I’m not sure exactly when the house-baked bread appears in its unusual red-and-black lacquer bowl. I just know I want to try everything, but that seems overly greedy. So I settle for two little bacon-studded epis and a crusty baguette. The server seems to sense our trio’s serious bread addiction and leaves the basket where we can do more damage at any time. 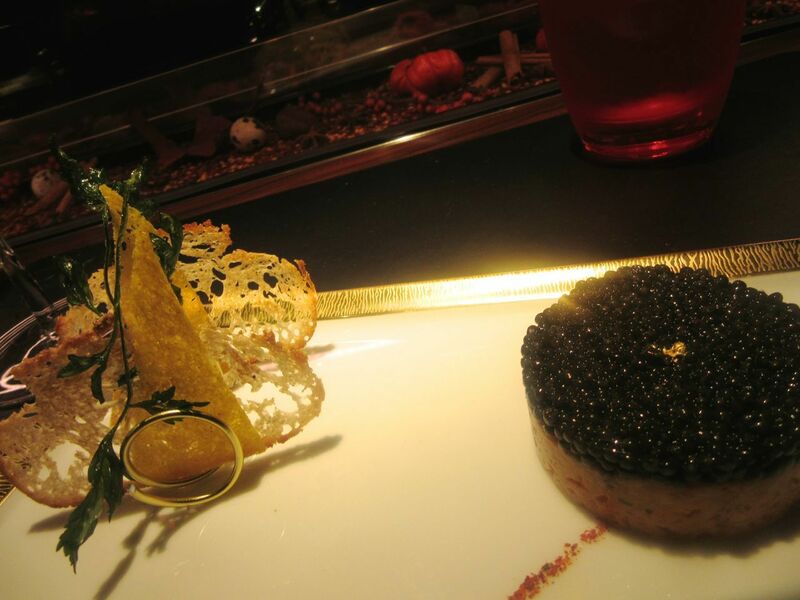 French imperial caviar frosts the salmon tartare with sticks of shiso and flutters of gold leaf. For two and a half hours or so, your server is trained to read and respond to every sign, every flutter of eyelash, every longing glance, every wiggle of nose. He watches your caviar glow. That’s French Imperial caviar, frosting the finely chopped salmon with curls of gold leaf in “Le Saumon en symphonie de tartare aux pousses de shiso.” Is this my favorite dish? I love the luxury, the simplicity and the saltiness. 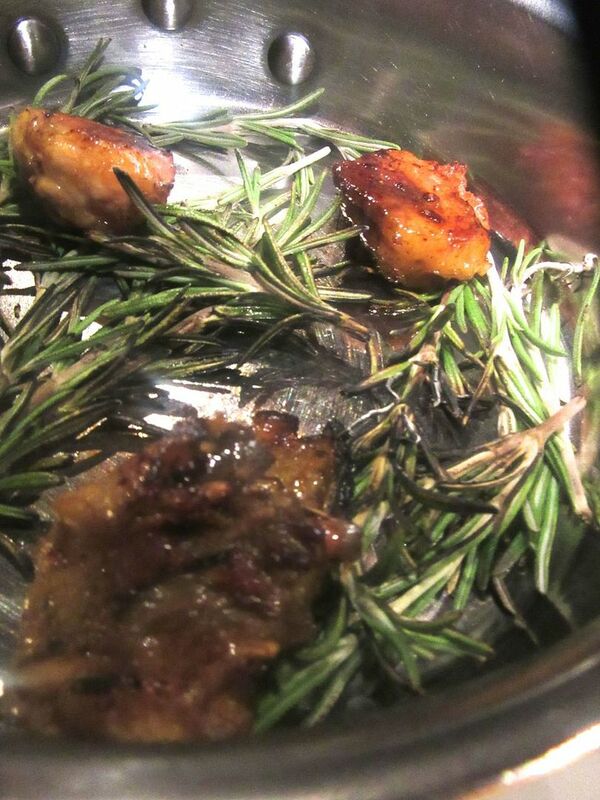 Artichoke thins with foie gras, black trompette mushrooms and sprigs of greenery seems a bit of a hodgepodge. 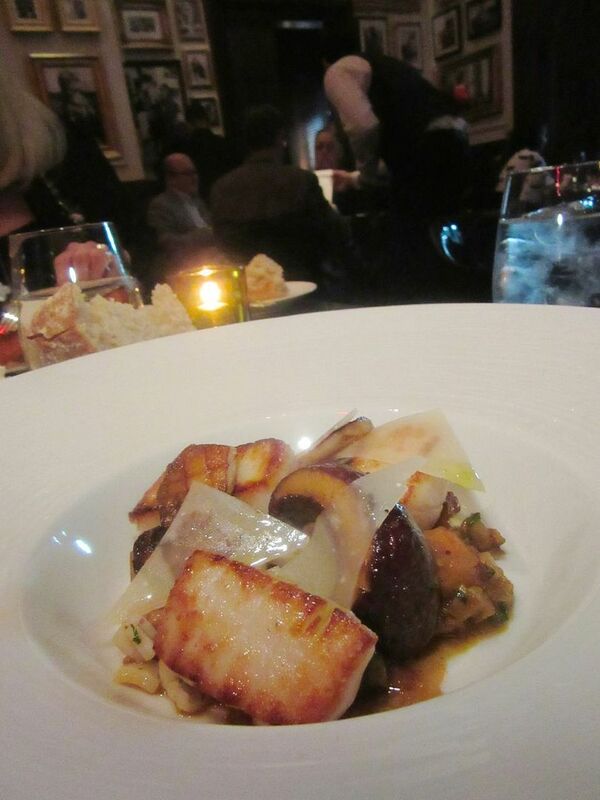 The artichoke thins with furls of foie gras, black trompette mushrooms, sprigs of greens, Parmesan, and super diaphonous toast strike me as a hodgepodge of overkill. I wonder out loud if Robuchon himself has actually designed it. He never struck me as a hodgepodge kind of guy. In his early days there were never more than four ingredients in a dish. I should note that I do admire the sweetness of the cooked artichoke shaved so thin, even though I’m mildly put off by the too-muchness of the dish. The organic egg on a spicy compote of eggplant may be my favorite dish of the evening. The next course makes up for any hiccups so far: “l’oeuf a la coque sans coque” -- a voluptuous soft-cooked egg on a compote of spicy eggplant with preserved lemon, chive, coriander, and fried potato crisps. It’s the evening’s high for me. I am drinking a big red Rhone Valley Jaboulet wine my friend decanted at home and brought along to share with Robuchon and the charming Philippe Braun, a veteran member of the globe-trotting team. It’s must be a trend: so many dishes come with smoke in glass bells. 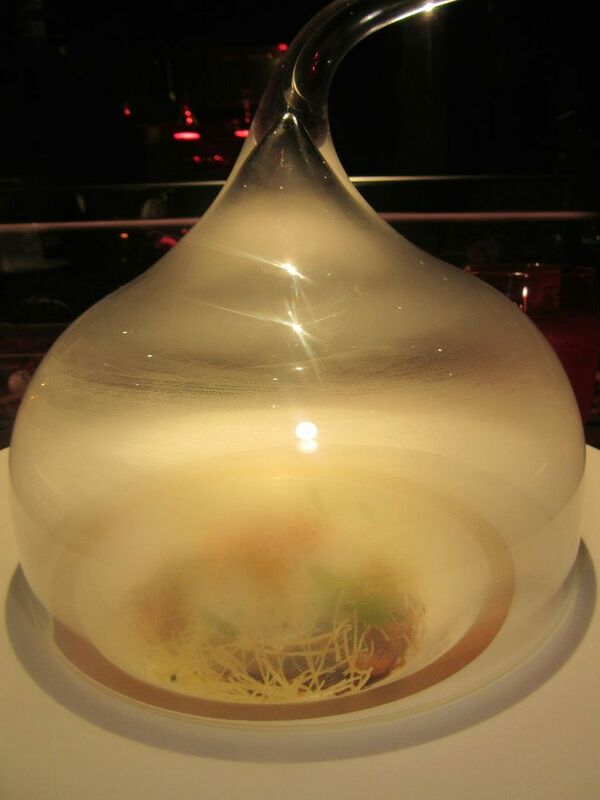 Several of the dishes are presented under glass bells filled with smoke. This makes it official: smoking is a trend. 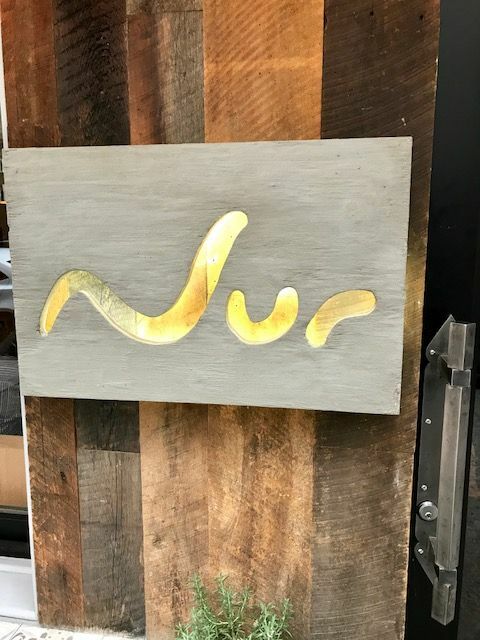 I noticed it at Nur last week. I especially objected to their smoked chocolate custard. But the smoke seems reasonably subtle here. 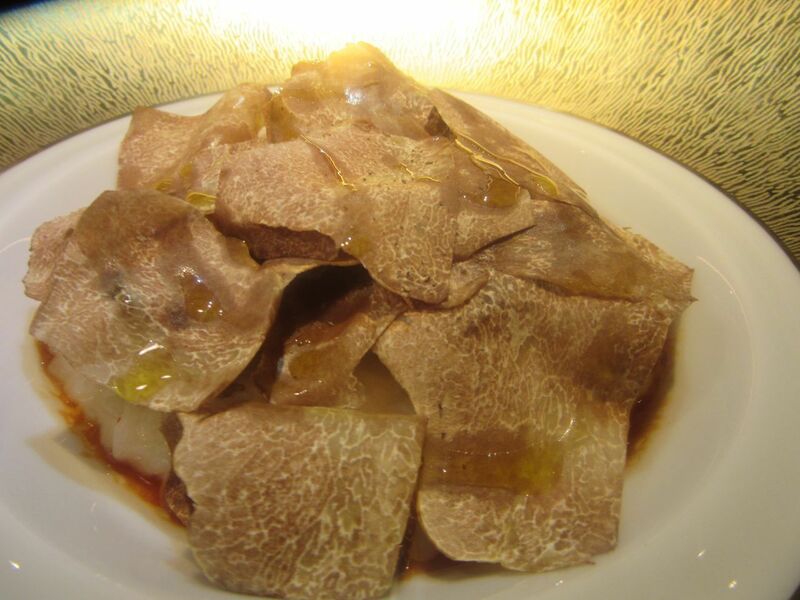 A fortune in white truffles can’t conceal that the risotto with luscious chicken morsels is too cooked. The risotto, blanketed with white truffle, and studded with small cuts of exquisitely rotisseried chicken, is overcooked for my taste. I hear my left-hand neighbor’s wife confessing to a duo of Robuchon brass that her favorite part of the bird is the part that goes over the fence last. I chime in to say it’s one of my weaknesses too. Speaking of luscious morsels, our telepathic entourage delivers a trio of croupions – the chicken’s rear end. “Oh, yes, le croupion,” says Braun, writing the French on the back of our menus. Minutes later our server delivers a trio of the fatty, prized parts, apparently from three chickens that have been rotating on a spit for most of the evening. The flirtatious Ellen gets two, and one is handed off to me. Mint sorbet in lime foam with rum jelly makes a nicely tangy palate freshener. 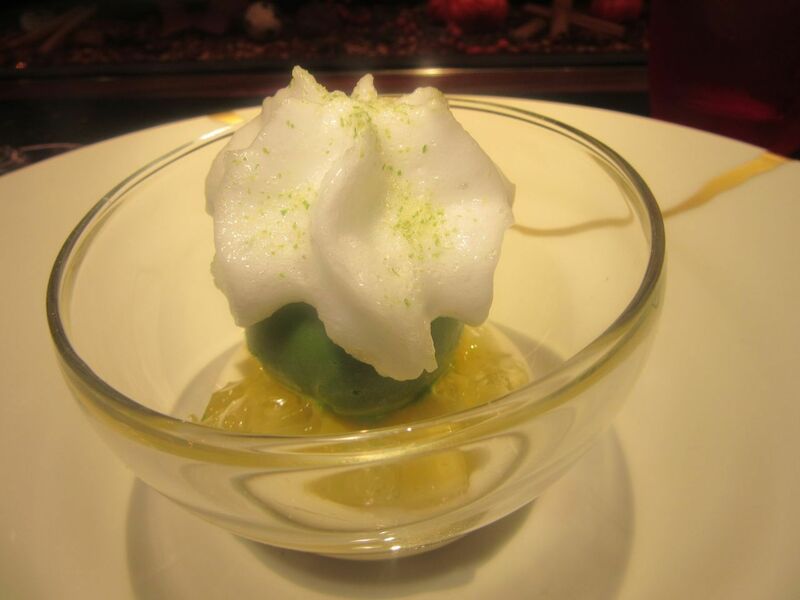 Not a moment too soon, rum jelly with mint sorbet and a lime mousse arrive to freshen the palate. I definitely need the pleasant limey-ness -- all that bread, too much food. And then: an astonishing Black Forest tableau that evokes a giggle. It’s a cake decked out like a mushroom with sherry mousse-chocolate cream, planted inside a burgundy glass lying on its side. Scotch tape keeps it from rolling. The garnet lacquer spoon lying alongside will protect the glass. 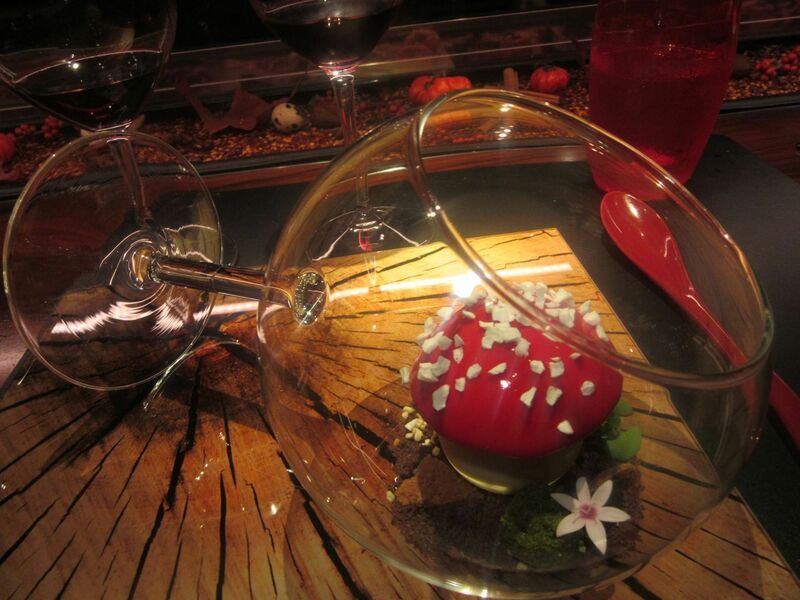 Time for a giggle: A Black Forest cake mushroom delivered in a burgundy goblet. Given a choice, I’d rather have a classic dessert -- a dark chocolate brownie or a hot fudge sundae -- than a Black Forest fantasy. Still, I do admire the humor. 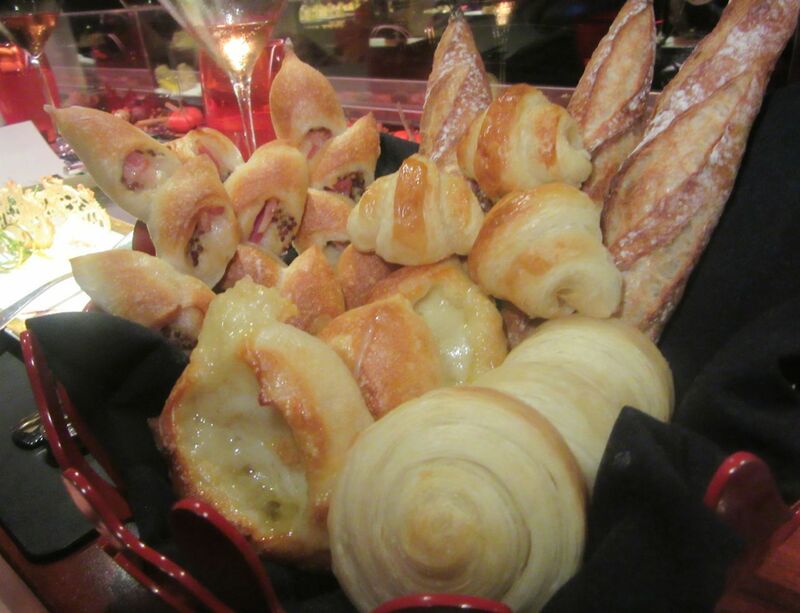 Pastry chef Salvatore Martone began as a pizza maker, then turned to bread, before becoming Robuchon’s pastry master in Las Vegas. 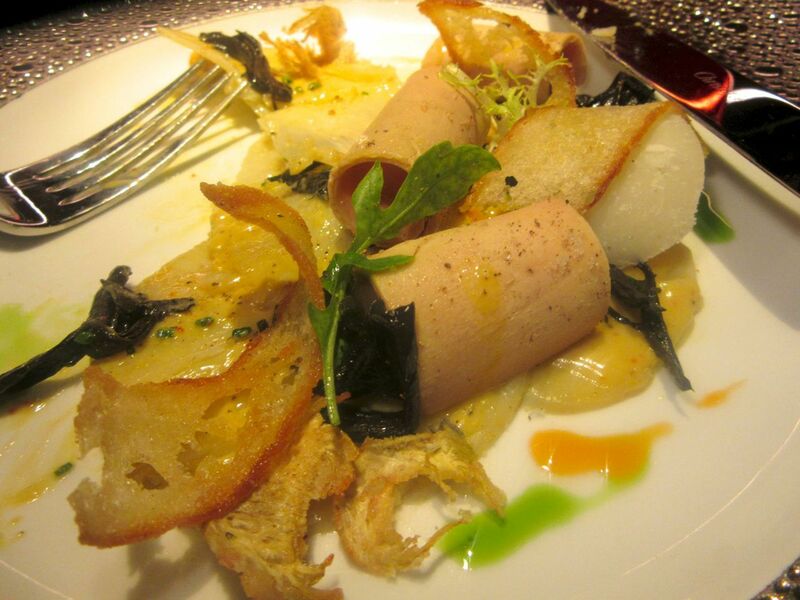 Chef Christophe Bellanca also trained there in the Robuchon repertoire. It's been a long evening, maybe the crew is getting tired, too. They only bring us two selections of mignardises, not enough for each of us to pop off one of each if we could which, it’s clear, we can’t. Excellent mignardises arrive but not enough so that we can each have one of each. It could lead to mayhem. 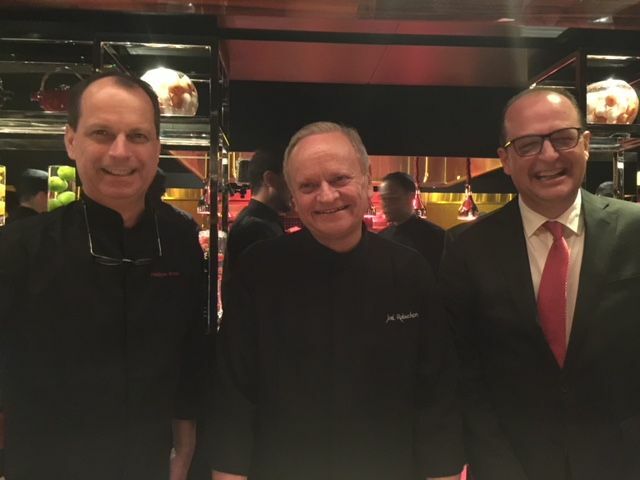 Robuchon’s international team of chefs and restaurateurs contract to work for him a week every month and assemble when he calls for an restaurant opening. The entire brigade seems to be on hand for the launch last week. Friends and family, Le Cirque regulars, Robuchon loyalists and those like us, self-nominated and unembarrassedly aggressive, have had a chorus of stars deliver our tasting. 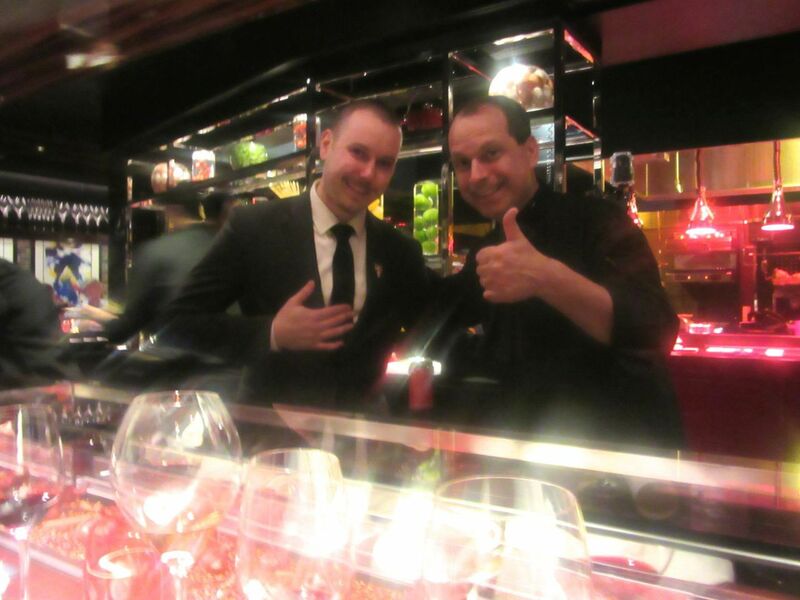 Robuchon’s globe-trotting Philippe Braun gives a thumbs up to the sommelier from Brooklyn (left). Alas, by the time you score your reservation, Robuchon and his team will be gone. Juan Moll might be back at his Hotel Lesort in Moraira. Braun will have returned to Toulouse where he runs Chez Fifi with his wife Alma before joining the warriors in Singapore. In three or four months, they’ll reassemble here on Tenth Avenue to make certain the New York cooks are keeping their edge. Here’s a slide of the Atelier at Le Drug Store on the Champs Élysées. 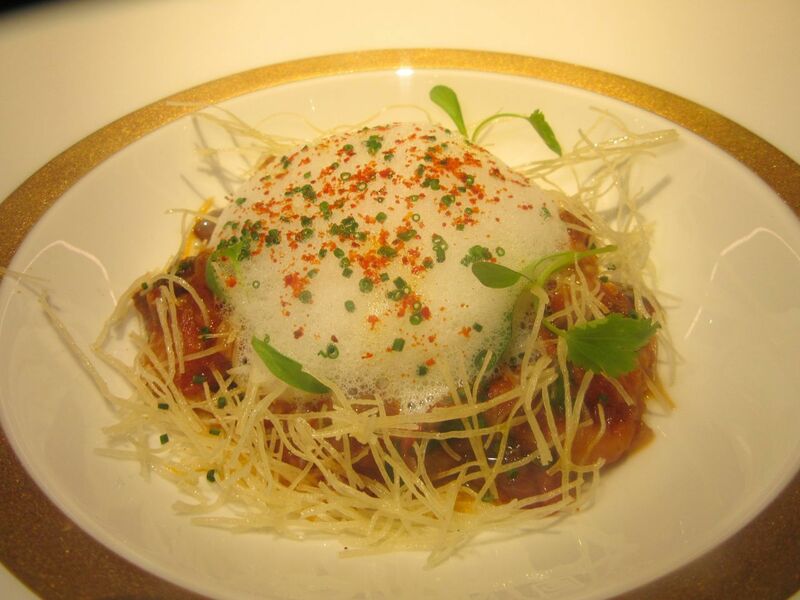 I first wrote about Robuchon's food at Jamin in 1988. In 1989 Robuchon was saluted as “chef of the century.” In 1994 his restaurant Jöel Robuchon was named the best in the world by the International Herald Tribune. He was famous for his ethereal mashed potatoes and a fiery temper. Two years later he announced his retirement. He cooked on television and published cookbooks. When he announced a comeback, Robuchon said he wanted to cook at a counter surrounded by the clients. It seemed such a modest desire. He opened his first Atelier in 2003. There are now counters in fierce demand everywhere, and tables, too: 12 L'Ateliers, six restaurants (a three-star restaurant in a French-style castle right in the heart of Tokyo, another three-star restaurant situated in Macao at the top of a casino and a three-star restaurant in the heart of the casino of MGM, Las Vegas). Outside these tables of exception, count the Restaurant of Joël Robuchon in Monaco (two-stars) and his Japanese restaurant Yoshi (one-star), not to mention satellites, salons de thé, pastry shops, boutiques and more grand conquests here. 85 Tenth Avenue between 15th and 16th streets. 212 488 8885. Open seven days from 5 pm to 11 pm.